Your car is one of your best and most expensive investments, so it’s just right for you to do something to protect it. ​Note that you’ll most likely expose your vehicle to extreme weather conditions, especially if you park it outdoors. With the help of a reliable cover, you can protect it from the potential damages that the weather can cause. For instance, you can protect it from rainwater, which is sometimes acidic, causing the sensitive and exterior parts of your car to corrode. Furthermore, it can cause the car’s paint to dry out as well as hard-to-remove water spotting. UV rays are also among the damaging elements of the harsh weather that you need to protect your car to as these can also cause the paint to fade. ​Covering your car will lessen its chances of getting stolen since it requires thieves to spend more time handling it, thereby dissuading them from targeting it. You can even find covers with a lock and capable, making it hard to remove. Aside from discouraging thieves, it’s also a good way to deter others from vandalizing your property. ​Some of the things wherein you need to protect your car are bird droppings, industrial fallout, and tree sap – all of which have the tendency of damaging the exterior. That said, you need to install a cover to protect your vehicle. ​You no longer need to worry about your investment getting damaged within just a short period. With the cover installed, you can retain its finish, paint and overall look for a long time. One of the car covers that are worth checking out is the Basic Guard 3-layer cover from Leader Accessories. It promotes a more customized fit, so it is an ideal option for you, especially if you plan to get a hold of a product, which can perfectly fit the shape, size, model and make of your vehicle. Many also consider it as the perfect cover for SUV as you can easily stretch and adjust it. The fact that you can stretch and adjust it is a good thing as it ensures that it can accommodate all SUVs even those that are twenty feet large. It can even cover a pickup truck, which is up to twenty feet and eight inches. Despite the many positive feedback of this specific car cover, it is still imperfect and has few flaws. One reported issue is the fact that you may have a difficult time figuring out how to use it for cover the first time. It’s because there are no clear instructions on which specific side goes where. Some even say that it is not that sturdy and is too rough. ​Still, it’s one of the most functional car covers on the market today. Another thing that you will look forward to in this product is the fact that it is fully made of environmentally friendly and biodegradable material. You can also find an elastic hem at the bottom, giving your vehicle a snug fit and protecting it in all possible ways. ​It is breathable plus you can expect it to provide superior UV protection. Such feature can protect your car from extreme exposure to the damaging rays of the sun that tend to harm not only the paint job but also your car exterior’s overall structure. ​2. Leader Accessories Xtreme Guard 5 Layers Waterproof Breathable Outdoor Indoor – Made of Highly Breathable Fabric. 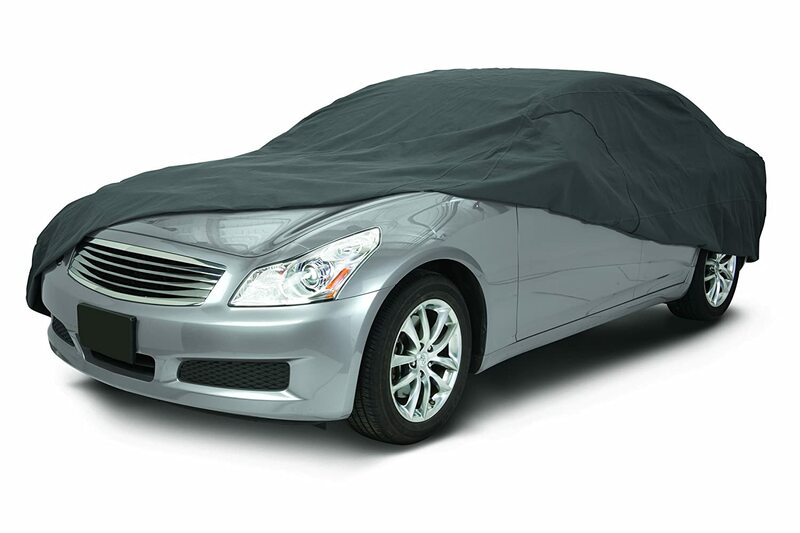 This car cover from Leader Accessories boasts of the fact that it is constructed out of highly breathable fabric. Such breathability is beneficial as it promotes maximum air circulation. It also prevents the development of condensation and moisture inside the cover, and let them evaporate instead. The breathability of the fabric used in this cover also minimizes heat during hot days. Despite being well-made, the cover still has a couple of issues. One is the fact that in some car models and makes, it tends to leave some parts and tires exposed. Another flaw that you have to take note of is its tendency to get waterlogged. Expect it to get too heavy during heavy rains. It’s because the cover directly absorbs the water, causing you to spend some time drying it. ​Still, it’s a solid car cover, which is flexible enough that you can use it both indoors and outdoors. It is a huge help in protecting your car from heat, dust, dirt, snow and rain. Completely based on a UV-resistant and water-resistant fabric, you have an assurance that the paint won’t get damaged by air pollutants and the UV rays. You can also easily handle and store it. ​3. 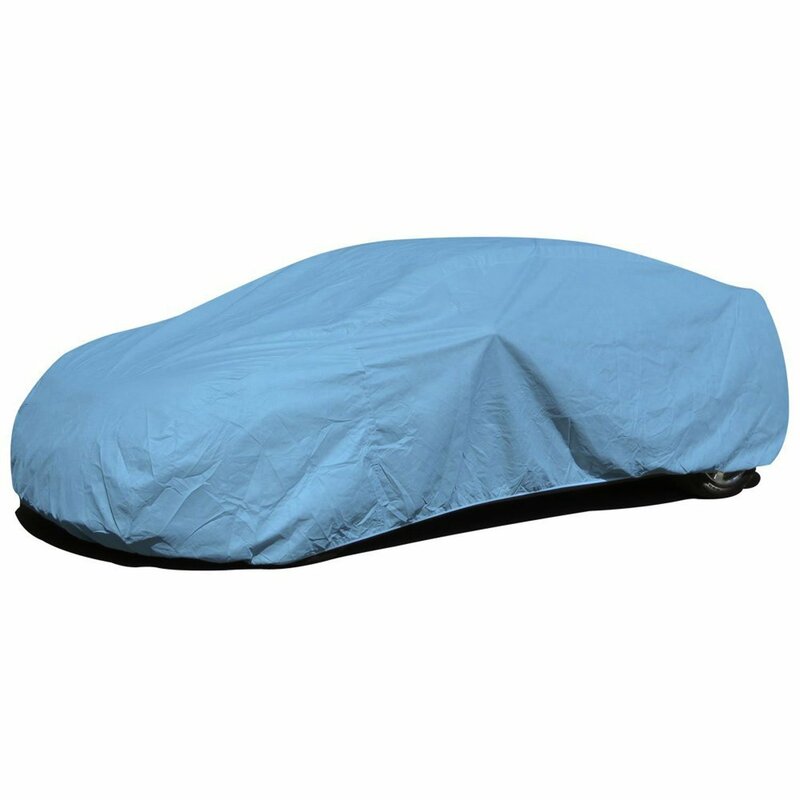 Budge Duro Car Cover – Ideal for Sedans Measuring Up to 228 Inches. Are you in search of a car cover, which can perfectly fit vehicles up to 228 inches, particularly Sedans? Then you’ll specifically love the Budge Duro Car Cover. It offers up to three layers of protection. Furthermore, the material used in it is UV-resistant, securing your car against the harmful UV rays that tend to fade its paint. One problem with this car cover from Duro is that it tends to wear out sooner than expected. Also, the material is paper-thin and too light on the sides, causing problems in making it stay in place during strong winds. However, you can easily solve this issue in lightness by utilizing the extra bungees and tie-down clips that come along with the product. Some users also hoped that it’s a bit bigger to ensure that it provides full coverage. ​Despite the issues, note that you won’t feel like it’s not a worthy investment because it is available at a low price. It can provide outdoor protection for the short-term while keeping it long-term when used indoors. It has built-in grommets that you can use in tying it down during extremely windy conditions. Furthermore, it comes with a fully elastic hem, securing your vehicle while also providing a snug and tight fit. It is also available in sizes that can perfectly fit trucks, vans, and station wagons. ​4. 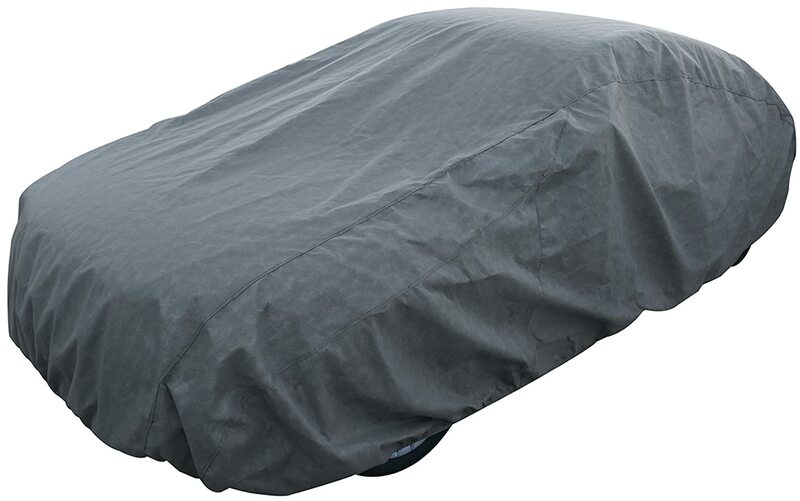 OxGord Signature Car Cover – Affordable with Attractive and Sturdy Features for Outdoor Use. This car cover from OxGord takes pride in its ability to offer up to five layers of protection. It’s tough while still ensuring that it stays soft enough that you’ll have an easy time handling it. It is made of breathable and durable material. The primary material used in creating the cover is also extremely waterproof and features a dual outer shell that can protect your car from UV rays. Despite the many positive reviews of this car cover, you’ll still encounter some flaws. For one, you may notice that the shark fin radio antenna of your car will start going into the fabric. It’s usually because of the blowing winds and the heavy weight of the material. Also, it tends to fly off during extremely strong winds. You might also have a hard time cleaning it off or washing it when it gets dirty. 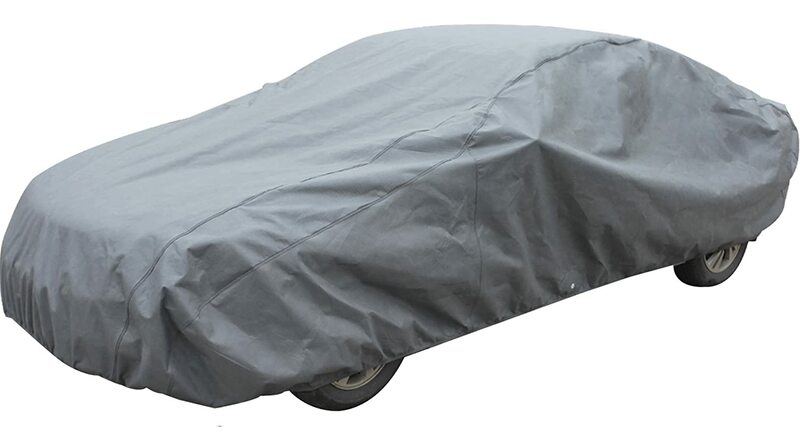 ​Still, this signature car cover from OxGord will efficiently perform its functions. It is an ideal option for you if you’re looking for a product with attractive and functional features without having to go overboard regarding the price. It perfectly fits sedans of various sizes. It’s better to use it outdoors than indoors. The fact that it has a hundred percent waterproofing ability is also an advantage. This cover is one of your most rugged choices, which clearly indicates that it has a strong capability of protecting your investment. It makes use of a triple-layer fabric, capable of resisting dirt while also repelling both snow and rain. It also offers excellent protection from UV rays and dirt. It’s based on a thick fabric but rest assured that it’s also soft enough that it will never scratch your vehicle’s exterior paint. It can even shield it from nicks and scratches. One problem with the cover is that it is not waterproof. Still, it can cover your car from light snow and protect it from leaves. Another issue is that it tends to have a too tight fit. Also, it is not too secure if you’re parking your car in a windy place, so you still need to create additional holes using your own grommets. ​Still, with its low price, it’s safe to say that it’s already a good investment. It has an elasticized bottom hem, so it can quickly fit your car. Moreover, it comes with a rope and non-scratch tie-down grommets. It gives you peace of mind since you know that your car won’t get damaged easily by heavy rains, snow, dirt, scratches, pollution, and other harmful elements. It also comes with an antenna reinforcement patch, as well as a storage bag. Custom Cover – One thing that makes custom covers beneficial is that they are capable of hugging each curve of your vehicle, making it look attractive each time you store it. Most of the products in this category are also weather-resistant. They are also easy to transport because they come with their own storage bag. Since it is a custom cover, you can find one which perfectly fits your exact model and make. ​Universal Cover – The good thing about this type is that it can offer you peace of mind without requiring you to spend hugely. While it’s not fully customized for your specific model and make, it’s still an inexpensive way to secure your vehicle from harsh outdoor and indoor elements. It’s also available in various styles and sizes, fitting any model. ​Aside from the type, another factor that you have to consider in searching for the best car cover is the breathability of the fabric used in creating it. 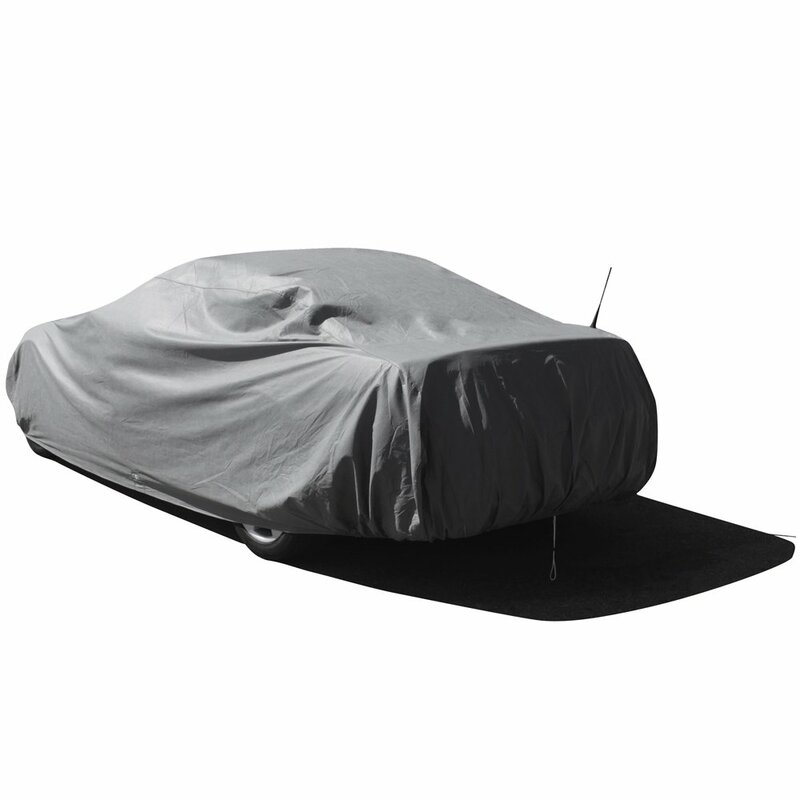 No matter where you intend to store your car, it’s crucial to look for a cover based on a highly breathable fabric. It’s mainly because such fabric lets moisture escape from beneath it, thereby preventing the risk of condensation from accumulating on the finish. Some great examples of breathable fabrics are satin and multi-layer polyester. ​Note that both mold and mildew are extremely damaging not only to the car but also to the cover that you use to protect it. The condensation in your garage, outdoor snow, and the rain might cause these fungi to grow, causing the cover to rot after some time. That said, you need to look for a product, which can resist the two. Look for one, which can shield your investment from various harmful elements and substances in the environment. If possible, go for one made of aluminized polyurethane acrylic as this material can efficiently resist molds and mildew while also being flexible enough to work both indoors and outdoors. ​Make sure that the cover’s finish is soft to prevent it from damaging your vehicle and causing scratches. Choose one, which features a soft satin lining, as this aids in keeping it scratch-free when stored. ​Also, check whether the cover is weatherproof. Find out how much it can protect your car from snow, ice, rain and other harsh weather conditions. Another thing you have to check is whether or not it offers protection against the harmful UV rays. You need a product, which offers protection against UV rays as these are among those items that tend to fade interiors and paintwork. ​Moreover, it should naturally follow the shape and lines of your vehicle. Such capability is vital in fully protecting it. It prevents wind flapping, giving your car the ultimate protection. ​It’s also essential for you to determine how often you intend to use the cover and where you intend to utilize it. These factors are also the key to identifying the most appropriate option for you. For instance, if you plan to use the cover in driveways and quiet streets then it’s advisable to go for outdoor covers that are lightweight. They should be easy to put on and remove. The good thing about the lightweight option is that aside from being easy to remove, you can also quickly fold it and store in a small space. On the other hand, if you frequently park in crowded parking lots at night or streets with too much traffic then heavyweight and thicker outdoor covers are the most appropriate choices. They can protect your car against dents and dings. You can even find some with additional cushion, improving their ability to keep your investment secure. ​It’s also necessary to pick a highly durable cover. Choose one made of a sturdy and durable fabric, which won’t be drastically affected by the cold or heat. It shouldn’t degrade its life over time. Make sure that it also requires easy care and maintenance procedures to ensure that you won’t have a hard time retaining its good condition and durability. Based on the products mentioned above, your best choice could be Classic Accessories 10-014-261001-00 OverDrive PolyPro Cover. Aside from the fact that it is affordable, it also continues to receive good reviews from its users. Also, some have already attested to its durability and the quality of its features.